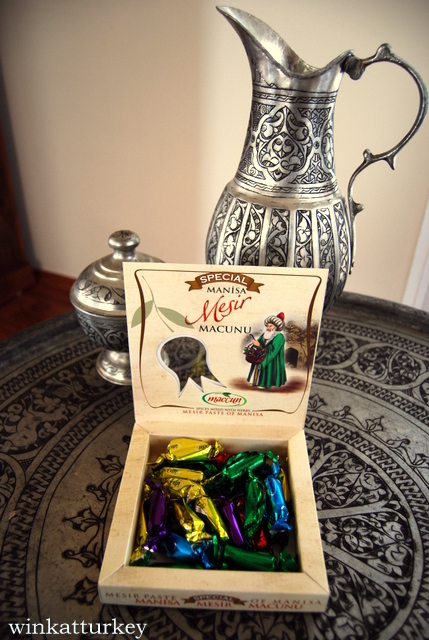 The mesir macunu It is a paste composed of more than 42 various spices and plants. It has one of the flavors and textures preferred by the Turks for over 5 ages. 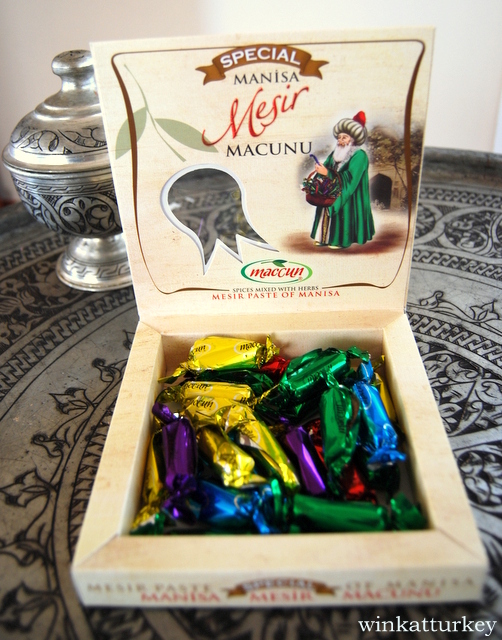 It started as a medical invention during the Ottoman period, but later became a tradition and became part of the local celebration of Manisa, city ​​that is located in the Aegean region about 40 km de Izmir. 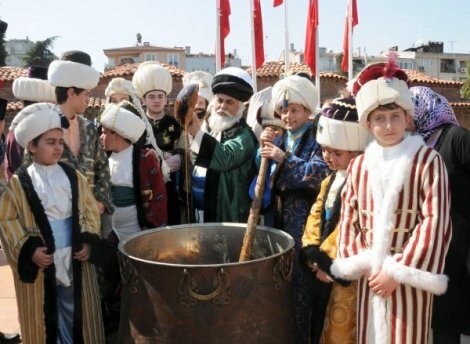 called Müslihidim, who used to prepare medicines using herbs and spices for people who were sick. The recovery was instantaneous and Sultan Suleiman decided to share the miracle mix with everyone. Since then, year 1527, tons of this compound are thrown from the minaret of the mosque of Sultan Manisa. 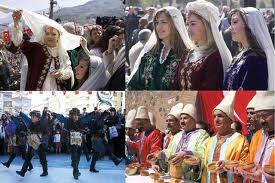 Each year around 21 March with the arrival of spring is celebrated in a big party Manisa, people dress in traditional costumes of the period and placed in front of the mosque to collect mesir paste, that flows from the top, wrapped in different colors. 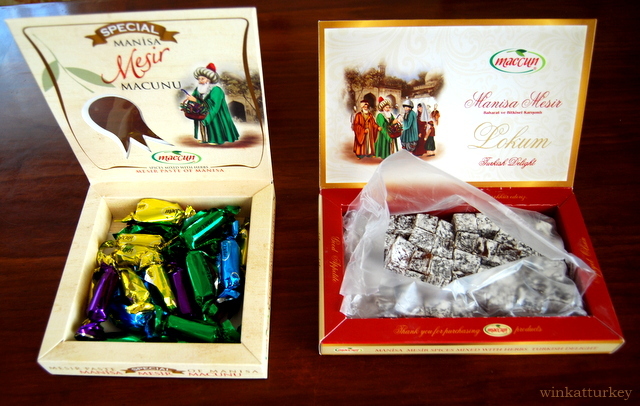 Currently marketed in different formats, como lokum (Turkish delight), chocolate, the, a kind of nougat, candy, and even in pills. You can see people selling this particular pasta in many places in Turkey, usually dressed in a very peculiar and colorful dress. The taste, indescribable, is what makes it very popular among the people like his great smell. The ingredients, above 41 spices and herbs including cinnamon, black pepper, nail, cumin, Allspice, mustard seeds, anise, coconut, ginger, Turmeric, saffron, vanilla, orange peel, regaliz, it, …. And so to the 41 forming the mixture. -It purifies the blood and has a detoxifying natural effect. -Known to be the oldest and most powerful aphrodisiac. I refer to translate what is written on the boxes macunu mesir. -After taking it you will not bitten by any venomous animal at least one year, What will it contains? -It will help in fertility problems, more or less you get pregnant only smell. -Recovery of many childhood diseases. True or not, do not know, the only thing I can say is that it is very well known and demanded in Turkey, I even sold on the internet. Just in case, I bought two boxes, ya the count. I love to visit Turkey!!!! Back and hopefully with you!!! Dew, so we can go ahead and enjoy a few days of this, playitas, Squid good, Kahvalti good and of course a trip to a beautiful place!!! !